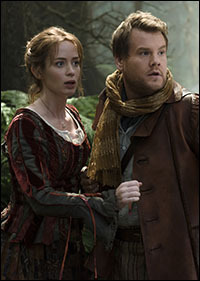 Emily Blunt On Hiding Her Real-Life Baby Bump, Vocal Nerves and the Much-Talked-About "Moment" in the "Woods"
In Stephen Sondheim and James Lapine's "Into the Woods," the Baker's Wife yearns for a child. Emily Blunt had that part of the role covered — almost too well. The Golden Globe-winning actress was pregnant on set…and had to hide her real-life baby bump from the cameras. "At the time, I was pregnant," explained Blunt — who gave birth to her first child, Hazel, in February 2014 — in an upcoming interview with Playbill magazine. "I hadn't had my daughter yet, but it was kind of extraordinary being pregnant and playing this woman, who was desperately yearning to be pregnant, and feeling like I was the luckiest person in the world… In a way, it gave me a deeper insight into this woman and her yearning to be a mother. Those maternal instincts were kicking in for me. It was kind of a trip, being pregnant and hiding behind every tree in the woods by the end of my pregnancy!" She continued, "I don't know if there are many roles in Hollywood that I would have been able to play pregnant, but the Baker's Wife is certainly one of them because I feel like she would have eaten a lot of carbs working in the bakery." "I've never heard of it," she admitted. "In England, it's not as big of a musical. The way I found out how much of a big deal it was here was that [when I told] my husband — who is not a fan of musicals — I was auditioning for 'Into the Woods,' he sang, 'Into the woods!' And, I went, 'How do you know it?! You don't even like musicals.' He said, 'Because every college in America does Into the Woods.'" She confided, "I was very, very nervous about going in to audition for it. I really don't like singing in front of people. I find it very embarrassing and nerve-wracking, but I'd been very much encouraged by Rob, who I knew previously from meeting him. He just said, 'Come on! I want to find the character. I don't need to hear it sung perfectly.'" To sing with the massive orchestra assembled for the major motion picture "was everything," said Blunt. "It was exciting and challenging and daunting. It was all of those things. Ultimately, I feel like my life was so enhanced by this experience. It was joyous, actually, getting to sing with a 60-piece orchestra — getting to feel like I was in another play. I haven't felt that way in a long time. I haven't done stage for about 10 years, and even though it was a very cinematic experience, it also felt intimate and collaborative and [like] the camaraderie that you don't get on film sets. "We rehearsed it for six weeks before we even did the pre-record, so at the time we did the pre-record with the orchestra, we knew exactly what the scene was going to be we knew the movement, we knew all of it." Copyright © 2015 Playbill, Inc. All Rights Reserved.